As you enter the Chequers Inn the warning 'Mind your head!' gives an idea of the history and age of this delightful old pub in the tiny hamlet of Rowhook just off the A281 Guildford Road. The place still functions as a local pit-stop and watering hole, with four fine real ales on tap and a sustaining line-up of dishes on the so-called Flagstone Menu. But Tim and Katy Neal's real passion is their restaurant, where the menus are centred on Sussex produce (with a few forays for exotica). Local goats' cheese bruschetta with balsamic roasted cherry tomatoes, olives and pesto, pork and herb sausages on creamed potatoes with caramelised onion jus, and pan-fried medallions of Sussex venison on braised red cabbage, fondant potato and Cassis jus give an idea of the style. Slotted in among these dishes are other ideas from further afield – perhaps pan-fried Scottish scallops with butternut squash purée and lime vierge, confit of duck on garlic mash with sherry and Puy lentil jus, and pan-fried breast of corn fed chicken with fresh linguine, pancetta, leeks and morels. Rounding things off are desserts ranging from sticky toffee pudding to vanilla pannacotta with lemon biscoti and honey-roasted figs. A full fat goat's cheese, made from unpasteurised milk & vegetarian rennet. Mild in flavour, produced in east Sussex by Kevin & Alison blunt. Made by Rob Bookham and the Harrison family. The basic cheese is Gouda in style, herbal & rich undertones. This cheese is a semi hard full fat cow's milk, made from unpasteurised milk. Vegetarian rennet and considered the king of British cheeses. This cheese is a full fat camembert style cow's milk cheese, made from unpasteurised milk. Rich & creamy with a mixture of sweet flowery flavours. All cheeses served with oat biscuits, grapes & celery. 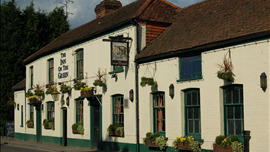 Situated 8 miles south of Dorking in the up-and-coming 'gastro village' of Ockley, the Inn on the Green is a multi-faceted set-up involving a fifteenth-century pub-with-rooms and a separate, family-friendly restaurant known as the Green Rooms.